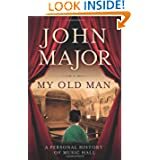 Former Prime Minister John Major recently published a book revealing his own unconventional family past and explores the richly colourful story of the British music hall. He will be speaking at the Victoria and Albert Museum about the world of British Music Halls from Elizabethan times through to Victorian times, a world that his father Tom entered at the age of twenty-one as a comedian and singer. This entry was posted in Book Tickets Now!, Lecture, Museum and tagged Albert Museum, Britain, John Major, Marie Lloyd, Prime minister, Vesta Tilley, Victoria, Victoria & Albert museum. Bookmark the permalink.